Plan Management helps you keep a track of your activations and the plans that you offer at your store. You can also keep a track of add-ons you sell. 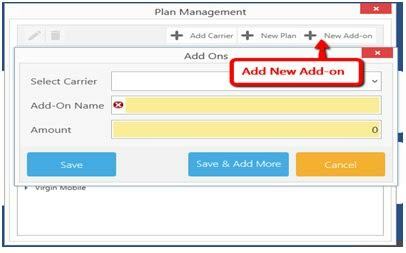 You can set your carriers and different plans through the plan management feature. • Click on Admin tools from the top. • Under the settings, icon click on the arrow and select plan management. • Click on add carrier to add the master carrier. • For example, you select Boost as the master carrier, the carrier name should be Boost mobile and the Bill payment product should be Boost Mobile Top up. • Check the box next to Bill payment product (Active) if you wish to add the plan amount to the transaction. • One done click on Save. • Click on new plan to add a new plan. 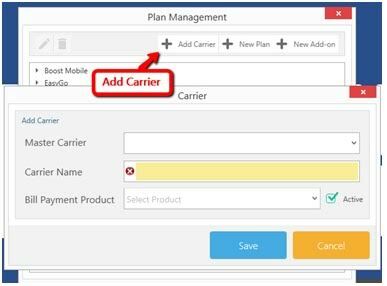 • Select the Master carrier under which you required to add the plan. • The plan name should be e.g. (Boost Mobile $35 plan). • The bill amount should be the same as the Plan amount. • If you want to save and add more plans click on Save & Add more or simply click on Save. • To add a new add-on click on New add-on. • Select the carrier under which you require to add the add-on. • Type in the add-on amount. • If you want to save and add more Add-ons click on Save & Add more or simply click on Save.